This is an alternating award given every 3 years to a faculty member who has excelled in teaching, research, or advisory service. This year's winner of the Outstanding Faculty Teacher Award is Dr. Mark Brush. Mark’s passion for teaching, commitment to fostering a comfortable and engaging learning environment, and enjoyment of interacting with students makes him fully deserving of this award. His contribution to the academic excellence of VIMS has gone above and beyond all expectations, illustrated by his average of 5.3 teaching credits each year. During Mark’s first year, he helped revitalize the curriculum of one of our core courses, Interdisciplinary Research in Estuarine and Coastal Systems. Course evaluations now highlight how ‘excellent’ and ‘well organized’ the class is, but what really stands out are the comments on Mark’s ‘positive energy and enthusiasm.’ His ability to teach highly complex subjects in a fun and engaging way ‘incites passion in his students and sets an important example.’ He expertly gauges the knowledge of students, consistently verifies their understanding of the material, and maintains an open-door policy to facilitate questions and discussions. Mark’s excitement for educational outreach extends beyond our community. 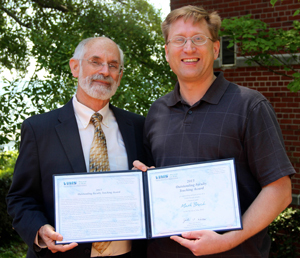 One of many examples is his service as a scientific mentor for a NASA program that helps Virginia’s math and science teachers develop lesson plans that incorporate ecosystem modeling into their classrooms. Mark’s students will tell you that he is an exceptional advisor, and it is easy to see that he cares deeply for their development as scientists and for their personal success. Since becoming a faculty member, Mark has advised 9 graduate students, 5 undergraduate students through VIMS’ Research Experience for Undergraduates program, 2 local high-school students, and 1 visiting graduate student. In addition, he has served as a member of 31 thesis and dissertation committees. Mark’s commitment to the academic program is apparent through his work on several academic committees. He is particularly enthusiastic about his role as chair of the Academic Status and Degree Committee, where he is able to advocate for students as they move through their milestones. Mark’s enthusiasm, positive attitude, helpfulness, research expertise, and engaging teaching style are all true assets to VIMS and make him fully deserving of this award.